Over twice the thickness of standard EPDM. 180% plus greater tear resistance. 60% plus greater impact resistance. The first synthetic rubber EPDM roofs were laid in the States by Carlisle™ Syntec in the 1960's and are still protecting these roofs today. Well known buildings rely on their EPDM rubber roofing such as Honda factories, Microsoft, Staples, Canary Wharf, Paddington Station, The Play House Theatre, schools, shopping centres, railway stations, hospitals and hundreds of thousands more commercial and residential properties. RubberBond™ FleeceBack™ is not affected by extremes of temperature. Installations are in varied climates - from the glaring sun of the Middle East to the freezing cold of Siberia and Alaska. RubberBond™ rubber roofing is not degraded by ultra violet or ozone as again witnessed by the many installations in hotter climates such as the Middle East. The colour of a dark grey slate looks natural and doesn't easily show dirt.The smooth synthetic rubber finish does not require ballast or chippings that have an annoying habit of blocking gutters and downpipes. RubberBond™ does not support moss growth. It not only looks good on day one but also stays looking good even after 30+ years… The additional thickness of FleeceBack™gives a superior finish especially important to maintaining and increasing your homes value. 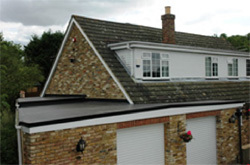 RubberBond™ FleeceBack™ rubber roofing repels all moisture and does not suffer with age from cracking or crazing. RubberBond™ FleeceBack™ "breathes" allowing vapours to escape, thus preventing blisters. Extremely ECO friendly materials all applied with little energy - Both Government and the International Kyoto Ecology agreement recommends EPDM rubber as Best Value sustainable eco-sound roofing. 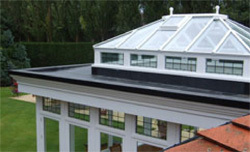 The RubberBond™ rubber roofing system holds British Board of Agrément certification no. 02/3967 BBA - is designated by government to issue European technical approvals.